Over the past few months, I’ve been overwhelmed by the response from so many of you who expressed serious interest in getting the community together again. 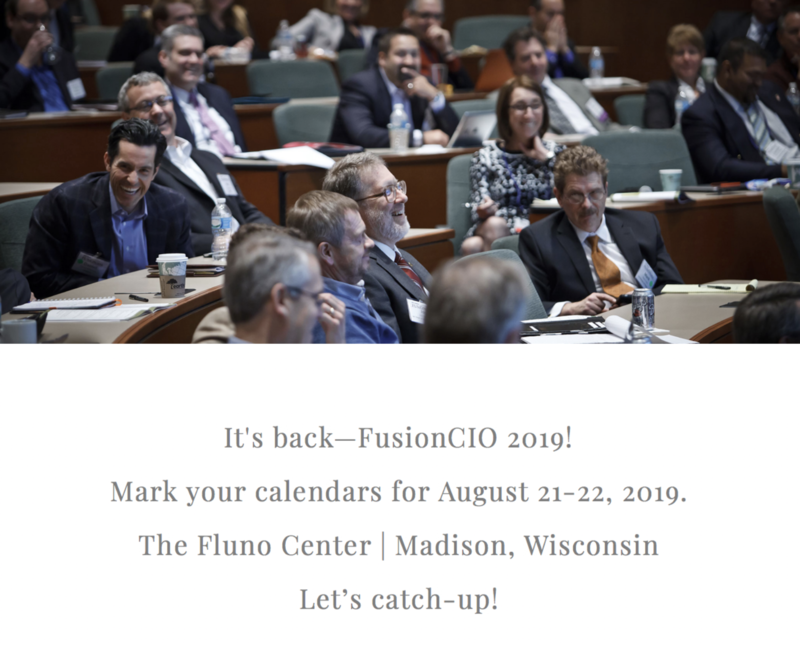 So, after a brief hiatus, I’m pleased to announce that FusionCIO is back! This year, we’ll focus on “people development, retention, and attraction,” as well as the state of the current technologies driving digital transformation across the enterprise. We’re developing the agenda with the overarching objective of addressing your organizations’ needs to stay relevant, competitive, and profitable in a fluid tech landscape. Mark McDonald, Peter Coffee, and Tom Koulopoulos will be making return engagements as keynote presenters. Over the next few weeks, I’ll be reaching out to you as we confirm additional speakers, topics, and sessions. In the meantime, we’ll provide regular agenda updates, hotel information, and early bird registration, as it becomes available. If you have questions or ideas, please email me. I’d love to hear from you and am looking forward to seeing you in Madison later this summer!